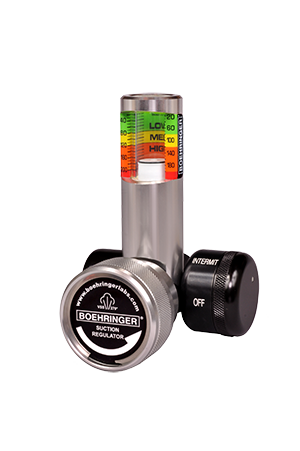 The new Platinum Series Suction Regulators are the next generation in suction control products. The Platinum Series features new options and enhancements that deliver a higher performance than any other suction regulator currently available. The new 3800 Series Suction Regulators are supported by a 12-Year Warranty. The 3804 Intermittent and Continuous model features technological advances that actually protect the interior regulating mechanism from flooding and contamination- the most common cause for regulator failure. This innovation gives the regulator extended life, which allows us to provide trouble free operation for the length of it’s 12-Year Warranty. We now know we have a suction regulator that is meant for our patient population, is safe, and free from dangerous contaminants. Appropriate for hospital-wide use for suction therapy procedures needing continuous of intermittent suction including closed suction, deep suction and oral care. Areas of use include: Critical Care, Emergency Room, and Inpatient Acute Care; Extended Care and Skilled Nursing Facility Care; Surgery Centers and Ambulatory Care. We guarantee the 3800 Series Suction Regulator parts and labor for 12-years. We will replace free of charge any part, including fittings and adapters, that fails on our 3800 Series Suction Regulator for the length of the warranty. You can now choose one of six color coded dials to add to your instrument to quickly identify the unit which owns the equipment. Please see the sales sheet for more detail.